For 13 years, Quality has been meeting together with OPEX & Manufacturing experts across the spectrum of Life Sciences companies under one roof to exchange their knowledge & experience in manufacturing excellence. 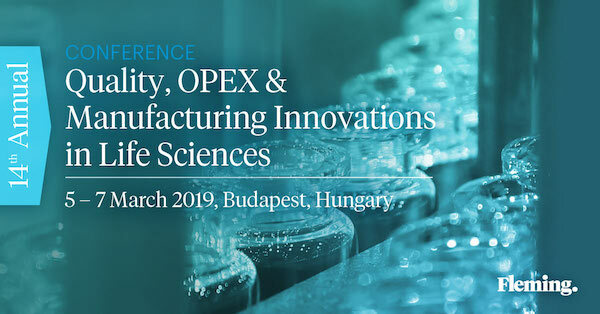 From the 05 to 07 March 2019 Fleming will host the 14th Annual Quality, OPEX & Manufacturing Innovations in Life Sciences Conference. In 2019, the conference will again bring a unique format with two parallel tracks focused on managing quality & OPEX in manufacturing in the changing regulatory environment & the digital age. During the two days, participants will hear inspirational talks on embracing Pharma Production 4.0 and the future of productivity beyond lean, agile and kanban. The program is filled with practical case studies as well as interactive discussions where you can share your views on making an organization ready for the change, setting up a digital mindset and the digitalization journey in quality and production. This event will bring you a chance to meet & network with a former MHRA GMP inspector and an OGYEI authority and gain their regulatory perspective on GMP and quality considerations. You will understand how to interpret and implement changes resulting from the emerging regulations such a revision of EU GMP Annex 1, serialization, continuous manufacturing regulation, new GMP for ATMPs as well as data integrity concerns. Joining for the first time, Fleming. is hosting The Lean Coach, Ms. Crystal Davis from the USA to bring outside-the-industry experience with lean production systems. Attendees will have the opportunity to actively take part and work on practical tasks in an interactive workshop led by The Lean Coach. Building on the success of previous site visits at Shire, Austria and Baxter, Germany, we are pleased to invite you to experience a site tour through the Xellia Pharmaceuticals premises in Budapest on March 5th, 2019. Secure your #SMPDiscounts using SMPQuality20 for 20% discount / €300 Euro discount. Keep up-to-date on Facebook, LinkedIn, Twitter @Fleming_Events and the Fleming website. The event hashtags are #QualityFE and #opexFE.